Last week, my boys had off from school. One day, B took them to the movies to see a The Jungle Book. While I didn’t go (my day job frowns on taking a few hours off to see a movie), it inspired me to watch the classic animated movie again. While watching it, I was struck by Baloo. He’s supposed to be a stereotypical slacker. Someone who’s big on partying and short on responsibility. (A "shiftless, two-bit jungle bum" according to Bagheera.) Upon watching the movie again, though, he’s surprisingly wise. A quick warning: There might be spoilers for the new Jungle Book below, but only if the new movie follows the 1967 animated movie. So technically these would only be spoilers if you haven’t seen the 1967 movie and I think the statute of limitations has long since passed for that film. Before I get to Baloo, let’s look at Bagheera. He’s supposedly the responsible one of the movie. He finds baby Mowgli and takes him to the wolves who raise him as their own child. When Mowgli’s life is threatened by Shere Khan’s return, he volunteers to lead Mowgli back to the man-village where he will be safe. Bagheera rescues Mowgli from Kaa – and winds up nearly being eaten himself. He’s definitely a role model, right? After meeting the elephants, Mowgli asks where they are going. Bagheera tells Mowgli that he’s going back to the man-village immediately. Mowgli insists he’s not going and Bagheera attempts to force him to go by pulling on his shorts with his teeth as Mowgli holds onto a tree. This ends with Bagheera falling into a river. (Side note: Those shorts were insanely strong. A panther pulling on them should have ripped them to shreds! Then again, naked Mowgli wouldn’t make for a family friendly Disney movie.) Bagheera, frustrated with Mowgli, declares that he’s on his own and leaves him. This, not even 10 minutes (screen time wise) after Bagheera told Mowgli that he wouldn’t last one day and after Mowgli was almost eaten by Kaa. I can sympathize with Bagheera when it comes to dealing with stubborn children. Both of my boys can be exceptionally stubborn at times. There are definitely times when I think that it would be so easy to just walk out the door and never return. The thing is, though, that those thoughts would never be put into action because I care about my kids too much. Even when they’re being a major pain in the neck and not listening, I might leave to a different room to cool down but I’d never leave them on their own. When Baloo encounters Mowgli, he could have just kept walking. Instead, he noticed that Mowgli was upset and alone. He tries to teach him to defend himself and purposefully loses to Mowgli to help cheer him up. 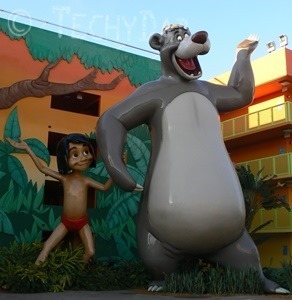 Then, Baloo teaches Mowgli about "The Bare Necessities." This is where Baloo gives three under-rated gems of advice. First of all, Baloo sings that you’ve got to "forget about your worries and your strife." All too often, we let our worries dominate our thoughts. It’s important to give ourselves time to put our worries aside. If we don’t, we might miss some wonderful aspects of life. I learned this lesson a long time ago. I’d hyper-focus on something that went wrong (especially if I did or said something wrong) and would ruminate on it for days. It didn’t help the situation in any way. It didn’t make me react differently the next time. All it did was cause me to obsess and doubt every action I took. I realized that I needed to be able to examine whether I could do anything about a worry at that moment. If I couldn’t, that worry needed to be shelved until such time as I could make a difference. Next, Baloo sings about using claws to pick prickly pears but not needing them for big pawpaw fruit. This is intended to be humorous (with Baloo singing a veritable tongue twister) but is sound advice. Every situation is different and the approach needed for one might be totally different than the approach that the second situation needs. If you go through life with just one approach – and an inflexible attitude that all situations need to have that approach for their solution – then you’re bound to "prick a raw paw." Finally, and perhaps most importantly, Baloo sings about minimizing your life. Like many people, we’ve accumulated a lot of things that seem important, but which we could easily live without. For example, a year ago we decided to cut cable. Before doing this, we wondered just how we’d survive without hundreds of channels of video programming coming into our house at every possible second. The answer was that it was a lot easier than we initially thought it would be. Were there bumps along the way? Sure, but it turns out that cable TV isn’t one of the "bare necessities" and you can live a full life without it. When you cut the extraneous out of your life, you leave more time for the activities that you actually are interested in. When Baloo is convinced by Bagheera that Mowgli needs to go back to the man-village, he’s heartbroken. In his short time with Mowgli, he had come to love Mowgli. On the other hand, Bagheera, someone who’s known Mowgli nearly his entire life, doesn’t seem upset at all about Mowgli being sent away forever. When Baloo fumbles in his "man-village talk" with Mowgli and Mowgli runs off, Baloo is determined to find him. For someone who sings about reducing your life to "the bare necessities," he certainly knows what is important enough to hold on to. Finally, when Shere Khan attacks Mowgli, it’s Baloo who stands up to the tiger, risking his own life to save the boy. In the final analysis, Baloo might not be the most responsible character in The Jungle Book, but he has a hidden wisdom about him. Many people in today’s society would benefit from channeling their inner Baloo from time to time. NOTE: The image of Baloo and Mowgli above is a photo I took at Disney’s Pop Century hotel in 2010, during the boys’ first trip to Disney World. 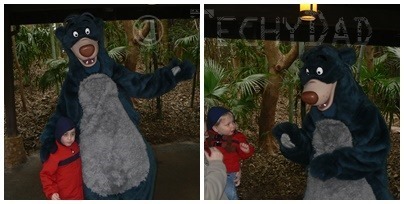 They also got to meet Baloo. This past weekend, we found some deleted scenes from this summer’s hit Guardians of the Galaxy movie. 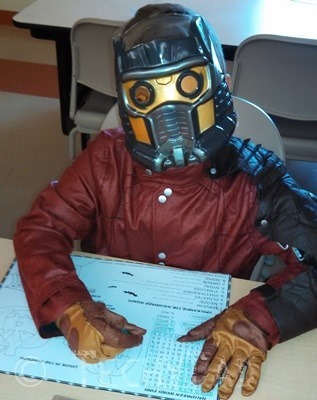 Here is Peter Quill, aka Star-Lord, spending some downtime between beating up bad guys trying to solve a Search-A-Word puzzle. I’m unsure if his mask is helping him find the words. No cheating! This is the scene where Star-Lord falls through a dimensional rift and winds up in the Angry Birds Star Wars universe. He has to battle Lard Vader before making his way back to his own realm. 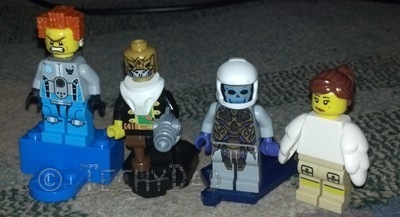 Ok, so these were scenes from a weekend Halloween activity and not Guardians deleted scenes. 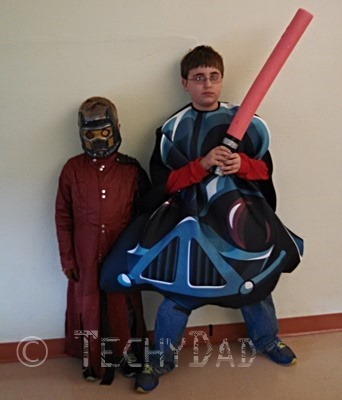 Still the boys had fun and are looking forward to Halloween. Speaking of looking forward, I just read the “Marvel Cinematic Universe Phase 3” plan and neither I nor my boys can wait. In case you haven’t seen it, here’s the rundown. Ant-Man (7/17/2015) – It will be interesting to see what big adventure this little hero will have. Captain America: Civil War (5/6/2016) – In the comics, the Civil War story arc started when Iron Man advocated for a law requiring all superheroes to register with the government (and have their secret identities exposed). Captain America, meanwhile, was against this and the two (as well as the superheroes on both sides) clashed. Sure enough, I’ve heard Iron Man/Tony Stark will be in this movie. Doctor Strange (11/4/2016) – According to rumors, Benedict Cumberbatch (aka Sherlock Holmes from the BBC’s Sherlock) is being asked to become the Sorcerer Supreme. Guardians of the Galaxy 2 (5/5/2017) – JSL is already asking about trailers for this and was disappointed that he’ll likely have to wait two years for one. Thor: Ragnarok (7/28/2017) – Ragnarok is the Norse concept of the end of days, but in the comics (according to my Wikipedia search) it dealt with a cybernetic clone of Thor being made when the original was thought dead. Will we see Thor and Evil-Cyborg-Thor duke it out on-screen? And what will this mean for the state we left Asgard in at the end of Thor 2? Black Panther (11/3/2017) – Another favorite superhero of ours. 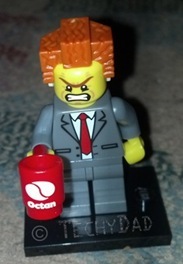 He will be played by Chadwick Boseman (whose previous works I haven’t seen). Interestingly enough, Chadwick’s IMDB page says he will also appear in the Captain America: Civil War movie. Avengers: Infinity War, Part 1 (5/4/2018) – Finally, the Infinity Saga comes to a head. We’ve been seeing the Infinity stones here and there and I’m sure we’ll see more before this movie comes out. What really struck me is that this is Part 1. They are going to do this right and take their time with the story. My best is that Part 1 will conclude with Thanos getting the final Infinity Stone and the heroes looking like they’re beaten against his tremendous might. Captain Marvel (7/6/2018) – There are many incarnations of Captain Marvel. I’m hoping they opt for the Carol Danvers one. It will be nice to see a powerful woman kicking some bad guy keister. Inhumans (11/2/2018) – The Inhumans are a society of individuals with fantastic powers that keep hidden away from “normal” society. They aren’t really fully human but aren’t mutants either. Their leader, Black Bolt can’t speak. Well, he can, but his voice is so powerful that a mere whisper of his could bring buildings crashing down. He’s definitely the strong, silent type. Avengers: Infinity War, Part 2 (5/3/2019) – This is the conclusion to the Infinity Saga. Expect heroes from many movies, not just Avengers, taking part in the final showdown against Thanos. Just picture Iron Man, Captain America, Thor, Hulk, Doctor Strange, Captain Marvel, and Black Panther fighting alongside Star-Lord, Drax, Gamora, Rocket, and Groot. It will be quite the team up. Where the Marvel Cinematic Universe goes from here, I don’t know. On one hand, I can’t wait to see it all. On the other hand, by the time Avengers: Infinity War, Part 2 rolls its final credits, NHL will be almost 16 and JSL will be almost 12. Maybe I can wait after all. What upcoming Marvel movie are you most excited about? What superhero would you love to see made into a movie? First, here is Chris Pratt (aka Peter Quill) giving a tour of the Milano spacecraft. Next up is an interview with Zoe Saldana who plays Gamora. Then, there is an interview with Chris Pratt. Finally, there’s something slightly spoiler-y ahead. If you haven’t seen Guardians of the Galaxy, stop reading now, bookmark this page, go to the theatre and see the movie. When you’re done, come back. Ok, everyone seen the movie, now? Good. In one of the credits scenes, a potted, re-growing Groot dances to music while Drax cleans his knives. This "baby Groot" was so incredibly cute that I instantly wanted one. Since I know I can’t have an actual Groot, I’d settle for one of those dancing flower toys reworked to look like Groot. I’m not the only one who wants one. Social media is ablaze with people asking Marvel to release this. Slashgear even has an article stoking the rumor flames by pointing out a non-confirmation statement about the toy (along with a photo of a rather clever hack). I expect that, if they do, it will disappear from the shelves quickly. I woke up in the morning, very tired. The previous night, I had been moving a website I manage from an old server to a new one and it wound up taking longer than I thought. Thankfully, the boys let me sleep late. Finally, it was time for a quick breakfast and then come up with something special to do. For the life of me, I couldn’t think of one thing I’d like to do that wasn’t really an activity for the boys. After spending much time racking my brains, B made a genius suggestion. She asked if I wanted to see Guardians of the Galaxy. I did but was on the fence as to whether the movie would be fine for the kids to see. After reassuring me that a friend of hers took her young kids to see it and that most of the inappropriate moments were related to cursing, not violence. We decided to take a chance on the movie. 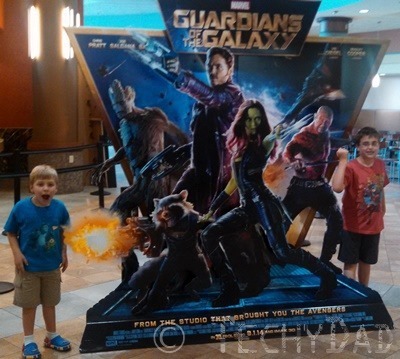 We got to the theater and attended a showing at a Regal Cinema’s RPX theater. This wasn’t a 3D showing (as JSL doesn’t like 3D movies), but the RPX screen is huge. It goes from just above the floor of the theatre to the ceiling. The previews came on and NHL immediately put his fingers in his ears. As I’ve written about before, NHL is Autistic and has sensory issues. One of these involves sound. The noise of the sound system was overwhelming to him. Thankfully, once the previews began, the volume seemed to level off and NHL seemed to be able to handle it. Guardians of the Galaxy was amazing. It was funny, suspenseful, action-packed, and had incredible visuals. Did I mention it was funny? I glanced over during many of the jokes to see B and the boys laughing. The crowd in the theater kept bursting out laughing as well. I’ve seen all of the Marvel Avengers-line movies (Iron Man, Thor, Hulk, Captain America, and Avengers) and loved all of them. 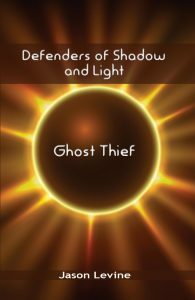 This one was definitely one of the best of the bunch – and that’s saying something. Not to spoil anything, but I want a dancing "baby Groot" for my desk. (As with any Marvel movie, stick around until the credits are done.) I now think the boys might be able to watch the other Marvel movies with me. After the movie, we made our way out to a Mexican restaurant for dinner. 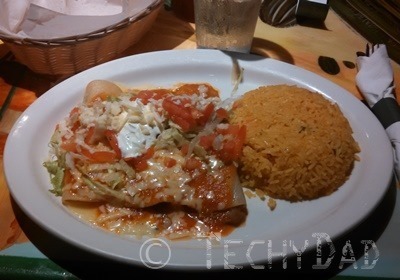 I had the Enchiladas Mexicanas – which were cheese, spinach, and refried bean enchiladas served with Mexican rice. It was delicious. After this, we picked up my cake from Price Chopper and went to B’s parents house for dessert. B’s parents gave me a cell phone accessory that everyone should have. 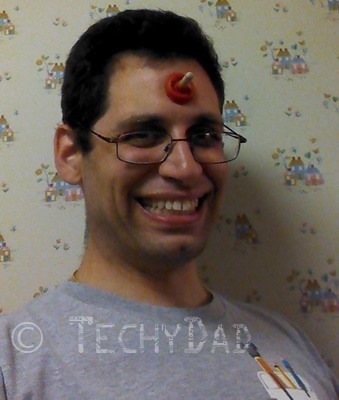 Yes, this is a portable Unicorn horn. 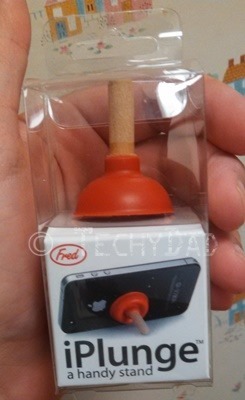 Wait, it’s a cell phone stand? Well, it’s multi-functional. 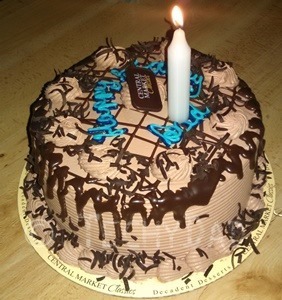 It was a wonderful birthday. I’d say I can’t wait for the next one, but forty is looming large. I plan on savoring this next year and hope it crawls by slowly.